Dr. Chadha graduated from the University of Michigan and the University of Delhi, and went on to join the legal and Treaties Division of the Ministry of External Affairs in 1992. She was then appointed as the first women Chief Legal Advisor to the Ministry of External Affairs in 2012. 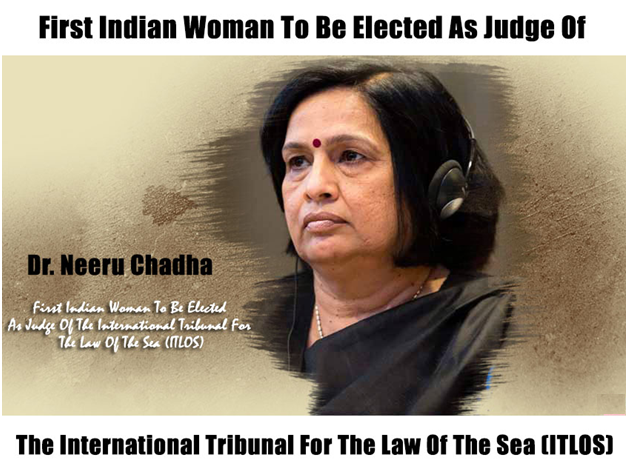 She was also India’s lead agent for the cases filed by Italy before the International Tribunal for the Law of Sea and at the arbitral tribunal in The Hague, in the incident concerning the accusation against two Italian Marines for shooting dead Indian fishermen off the coast of Kerala in 2012. Dr. Chadha had also represented India before the ICJ in 2016, When Marshall Island had accused India of not taking its disarmament obligations seriously as a nuclear weapons state. She has represented the Indian government in various other multilateral meeting and conference before the United Nation, AALCO (Asian African Legal Consultative Organization). UNIDROIT (International Institute for the Unification of Private Law), UNCITRAL (UN commission on International Trade Law).